DAYLE Joseph is back coaching the Geraldton Buccaneers in 2019 and would have taken a 3-1 start if given it a month ago and while happy to have had his full group together from the start, he only expects them to continue to improve. With Ray Evans deciding to step aside as head coach after a 2018 season that saw the Buccaneers claim the regular season championship but then lose in the first round of the playoffs to the Rockingham Flames, Joseph ended up as the man to replace him for his second stint at the helm. One thing Joseph wanted was to have the full squad ready to go ahead of Round 1 and not try to blend players in throughout the season and then hope the chemistry was right. For that to come to fruition, Joseph was glad to see that imports Willie Conner and Colter Lasher were in Geraldton well ahead of Round 1 as were Marcus Alipate and New Zealander Brayden Inger. Then along with 782-game champion veterans Matt Wundenberg and Aaron Ralph along with Brendan Dinardo, James Paringatai, Liam Hunt and some emerging local youngsters, Joseph was content with the squad he had to work with. The results started off impressively too with home wins against the Rockingham Flames and South West Slammers by a combined 66 points before then beating Kalamunda on the road by 29 points and losing to Perry Lakes by seven. Joseph was happy to have had his full group pretty much together from before the season and through the opening three weeks, and has no doubt they will now only continue to get better as a unit the longer they spend together. “We’ve pretty much had two weeks from before the Blitz that we’ve had our full team together. Willie is still settling in and getting to know some of the plays and could do that a bit better, and even Colter gets lost at times with our offences,” Joseph said. Inger looks like being an outstanding addition to the Buccs frontcourt this season and already over the opening four games the 20-year-old is averaging 17.0 points, 7.3 rebounds and 2.5 assists. Joseph couldn’t be happier already with what he’s providing. “You forget that Brayden only just turned 20 last week and it’s easy to forget how young someone like he is, and that he still needs a lot of coaching as well and some guidance,” he said. It can always take some time for any new guard to get acclimatised to playing in a new league and a new country, and that is the case with Willie Conner. But he’s been impressive at the same time with 14.3 points, 3.3 rebounds and 2.8 assists a game. Joseph also expects him to only get better with the more games he plays with the Buccaneers. “I see a lot in Willie. He’s got better every week and he’s a team first player which always goes well,” Joseph said. Looking at the start to the season with the big home wins over the Flames and Slammers, road win against the Suns and narrow road defeat to the Hawks, Joseph is reasonably happy with what he’s seen reflecting on last week’s road trip. “We’ll be happy if someone said you’d start the season 3-1, I think you’d take that. Our thing is just focusing on getting better each week. We need to learn from what we can get better at and make sure we don’t have the same issues come playoff time that we’re having now,” he said. “We always come with a focus of the priority being to get that first win and then you see what happens in the second game where we’ll always give it our all. As for their first road trip double-header last week with a 29-point win over the Eastern Suns and then a seven-point loss to Perry Lakes the next day, Joseph got back on the bus to Geraldton reasonably happy with what he seen and what the Buccs still had to work on. 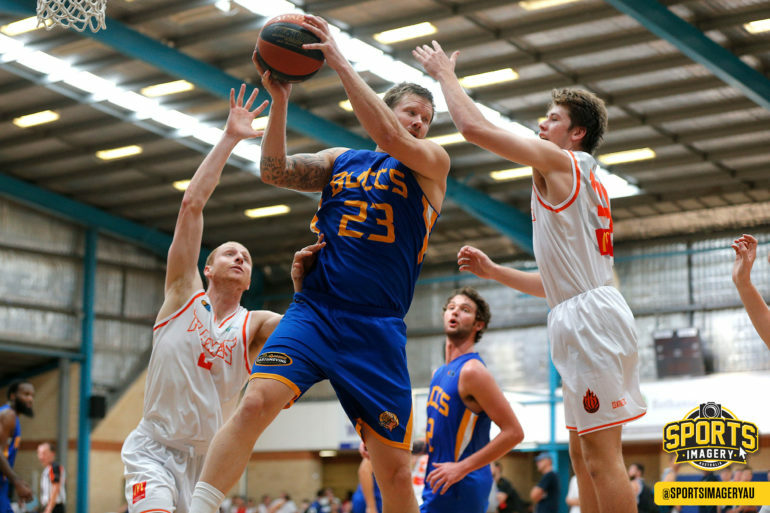 There were challenges on the Saturday night with the zone defence from the Suns, but the Buccaneers produced a huge second half scoring 81 points once they made some adjustments. Then it was a tough outing on Sunday against the defending champion Hawks, but Geraldton still had their chances so Joseph left feeling not too bad despite tasting defeat for the first time in 2019. “We had some good things happen and we corrected a few things at half-time (against Perry Lakes), which I think made a difference and we slipped up on a couple of other things,” he said. “Like I said to the boys afterwards, we’ll probably learn more from that game than we will from the previous three wins. We have to take the positive out of that and they are a good team too. They are probably than they were last year. As for how he’s feeling a month back into the role in-season as a head coach, Joseph never knew it wouldn’t be without its challenges but he is glad to be back in the job. “It’s definitely challenging and the Perry Lakes game especially so,” Joseph said.